I just looked at my credit report and there is a payment for $1 on my credit that I DID NOT make. This has been in collections since July 2012 and payment was just made this month. How do I find out where the payment came from? Can credit collection agencies make a payment on your account so it stays on your report ? Thank you ! They cannot 'make a payment' for you. Dispute the payment with the credit bureaus. If it comes back verified, you have grounds for a lawsuit. 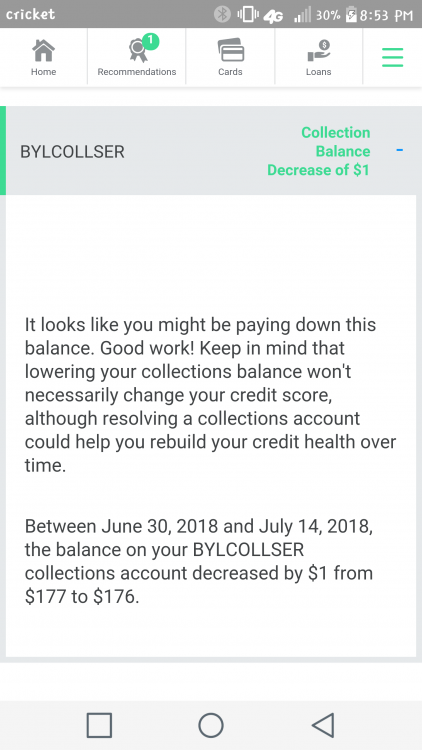 I attached a notification of the $1 payment. I will try to dispute it and update on the outcome. I am wondering if they are doing it to get my attention? I have never received a letter from them regarding the collection in a few years. I didn't understand what you were saying, and I thought you had something showing a change in the "last payment" fields. What you are showing looks to me like they merely rounded down this reporting cycle as opposed to rounding up in previous circle cycles. If my suspicion is correct, it has no effect on the length of time the debt stays on your report, and wouldn't be considered inaccurate.